Barn Owls are incredibly site faithful and will stay in their home range for their whole lives. One of the findings of our Barn Conversion Research Project is ‘knock-on effect’. This is the desertion of other nearby sites after the loss of a major roost or nest site. Site loss can therefore have a devastating impact on local Barn Owl populations, and should be avoided, mitigated or compensated for if at all possible. Buildings falling into dereliction and disrepair, or demolition. 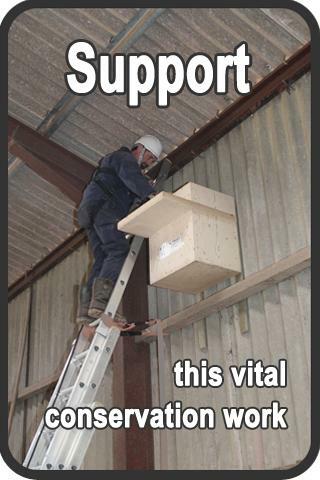 Poorly maintained or badly built man-made nestboxes full of debris or falling to pieces. What should I do if I know a site is likely to be lost in the future? As close as possible to the existing site but where disturbance won’t be an issue. With the landowner’s permission. Generally, most landowners are receptive and supportive if you explain how important it is to mitigate nest/roost site loss. What should I do if a Barn Owl site has already been lost? If a site has been lost, for example a hollow tree has fallen down or the roof of a derelict barn has been blown off, then please erect a suitable nestbox nearby as soon as possible, as above. Planning decisions – the correct course of action to mitigate for site loss. Where’s the best place for your nestbox – choosing the optimum location for a nestbox.